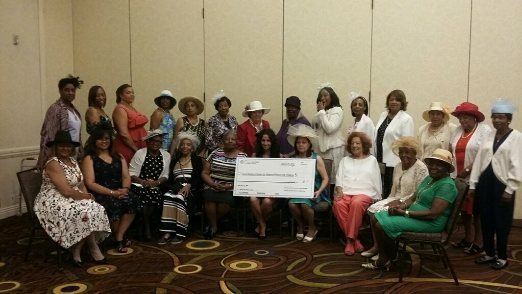 At the Supreme General Chapter Conclave held on August 3, 2018 at the Hyatt Regency in Anaheim, CA, the Sublimed Meritorious Fourth Degree Ladies of Grace Division of the Knights of Peter Claver, Incorporated elected a member of Ellen Marie Jackson Chapter 13 as its 8th Very Faithful Supreme Comptroller. 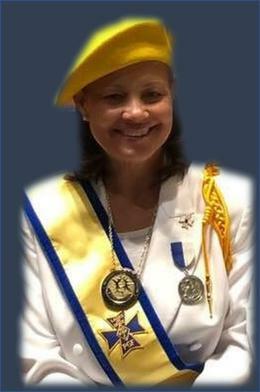 Gracious Lady Franz Aubry will serve on the Supreme General Chapter Board of Directors responsible for nationwide duties that include processing of new members considered for 4th degree elevation, communication to all Chapters within the Ladies of Grace Division, and receipt and distribution of supplies, regalia, and other material used in the Ladies of Grace Division. An awesome list of responsibilities but one our very own FRANZ AUBRY can handle and will manage with astute efficiency. CONGRATULATIONS and the Gracious Ladies of Chapter 13 are proud of you!!!! On March 16, 2018 God called home his beloved servant. Lady Muriel Wallace became a member of the Knights of Peter Claver Ladies Auxiliary on October 23, 1971 and was a member of Sacred Heart of Jesus Court 121 in Los Angeles, California. Lady Wallace served her District as Western States Conference Secretary and Treasurer. She along with 10 other Ladies Auxiliary members stepped out on faith and established an entire new division of our Noble Order the Sublime Meritorious Fourth Degree Ladies of Grace Division on February 14, 1981. Gracious Lady Wallace then became a Charter member of Ellen Marie Jackson Ladies of Grace Chapter 13 where she served faithfully as Faithful Navigator (1987-1988) and Faithful Purser. The Ladies of Sacred Heart of Jesus Court #121 and Ellen Marie Jackson Ladies of Grace Chapter 13 celebrated mass in honor of Gracious Lady Muriel Wallace on April 8, 2018. "O God, Whose property is always to have mercy and to spare, we humbly beseech Thee for the soul of Thy servant Muriel Wallace, which Thou hast this day commanded to depart out of this world, that Thou wouldst not deliver it into the hands of the enemy, nor forget it unto the end, but wouldst command it to be received by the Holy Angels, and conducted to Paradise, its true country; that as in Thee it hath hoped and believed, it may not suffer the pains of hell, but may take possession of eternal joys. Through Christ our Lord." The Archdioces of Los Angeles African American Catholic Center for Evangelization (AACCFE) honored two Gracious Ladies from Chapter 13 at its February 17, 2018 Annual Black History Month Mass Celebration. 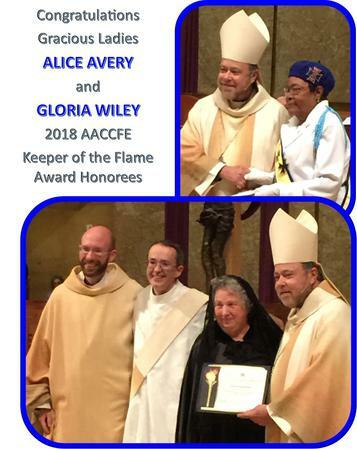 The Keeper of the Flame Award is presented, annually, to one parishoner from each of the parishes belonging to the AACCFE. Individuals are nominated by their respective parish to receive the award. Gracious Lady Alice Avery was presented the award for her over 55 years of service and membership in the St. Albert the Great Catholic Church community. Gracious Lady Gloria Kromeich Wiley was awarded by her parish St. Raphael Catholic Church, for her unwaivering and tireless support of the church and all of its ministries. Most Reverend Alexander Salazar, Auxiliary Bishop-Vicar for the Office of Ethnic Ministry, presented these awards as the celebrant for the 2018 Black History Mass held at the Cathedral of Our Lady of the Angels in downtown Los Angeles, CA. Gracious Lady Catherine Brown also accepted a Keeper of the Flame Award from Bishop Salazar, on behalf of her son, Knight William King who was unable to attend. Congratulations to all award honorees but especially to Gracious Lady Alice Avery and Gracious Lady Gloria Kromeich Wiley of Ellen Marie Jackson Ladies of Grace Chapter 13. Chapter 13 members attended a busy weekend, January 13-15, 2018, of Martin Luther King commemoration activities that KPC leads in organizing on behalf of the Archdiocese of Los Angeles including the Annual Martin Luther King Prayer Breakfast and Mass Celebration. Top photo is of Archbishop Jose Gomez and the Gracious Ladies of Chapter 13 attending the 2018 Archdiocese of Los Angeles Martin Luther King Prayer Breakfast on January 13, 2018 at the Proud Bird Restaurant in Los Angeles, CA. Pictured from left to right are Gracious Ladies Gertie Moncrief, Franz Aubry, Micaela LeBlanc-Faithful Navigator, Shirley Rachal, Lori McCoy Shuler-Western States District Deputy, Archbishop Jose Gomez, Karen Pinson, Jennie Dudley-Faithful Captain, and Doris Tims. 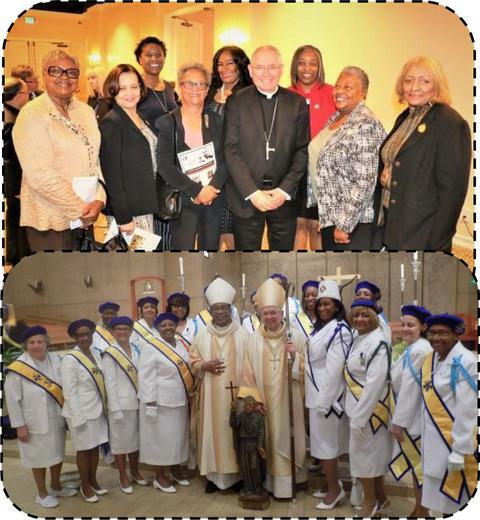 The bottom photo includes the Gracious Ladies of Chapter 13 with Bishop Terry Steib of Memphis and Archbishop Jose Gomez at the January 15, 2018 Archdiocese of Los Angeles Martin Luther King Mass Celebration at Our Lady of the Angels Cathedral in downtown Los Angeles. Pictured in the bottom photograph from left to right; first row-Gracious Ladies Gloria Wiley, Lydia Price, Shirley Rachal, Jennie Dudley, Bishop Terrry Steib-homilist for MLK Mass, Archbishop Jose Gomez-celebrant, Lori McCoy Shuler-KPCLA Western States District Deputy, Doris Tims, Franz Aubry, and Helen Cissell; second row--Gracious Ladies Gloria McClaurin, Teresa Pettiford, Sharon Agnew(member LOG Chapter 49-Las Vegas), Cheryl Pyles, Karen Pinson, and Barbara Williams. 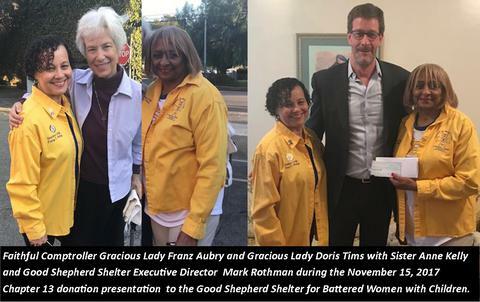 Gracious Lady Doris Tims, presented the Chapter's donation to the Shelter's Executive Director, Mr. Mark Rothman on November 15, 2017. This donation is a continuation of the over 36 year commitment Chapter 13 has made to the Good Shepherd Shelter for Battered Women with Children. 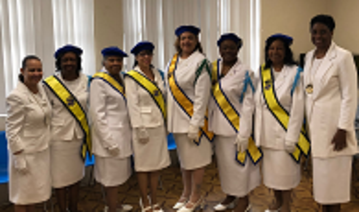 Chapter 13 welcomed five new Gracious Ladies to the ranks of the Sublimed Meritorious Fourth Degree Ladies of Grace Divison on January 5, 2019. New Gracious Ladies included in the photo Gracious Lady Cynthia Jones, Gracious Lady Virginia Moore, Gracious Lady Cheryl Blount, Gracious Lady Clarise Bronson, and Gracious Lady Edwina Clay. The new Gracious Ladies were joined by Most Supreme Micaela LeBlanc, Supreme Comptroller Franz Aubry and Faithful Navigator Monique Rigard. is the new Faithful Navigator of Assembly 13 for 2017 thru 2018 term. Gracious Ladies of Chapter 13 with Sir Knight Deacon Mark Race, Sir Knight Deacon Jose Alexander and Father Umeh who presided over the 2016 Mass for Deceased members of the 4th Degree. Sir Knights/Gracious Ladies of Assembly and Chapter 13, and family members of deceased 4th degree Sir Knights and Gracious Ladies attending the 2016 Memorial Mass Celebration at Holy Cross Cemetary in Culver City, CA in October 2016. Cross Cemetary located in Culver City, CA on October 25, 2015. Seated left to right: Doris Tims, Jennie Dudley, Pastor JoAnn Sanders (Guest Speaker), Francine Martin-Volunteer Coordinator for Good Shepherd Shelter for Battered Women w/Children, Renita Lloyd-Smith-District Deputy KPCLA, Charlotte Canfield, Estelle White, and Catherine Solomon. Standing left to right: Lori McCoy Shuler, Barbara Williams, Karen Pinson, Zackrea Jones, Margaret Chapman, Margaret Jones, Theresa Pettiford, Cheryl Pyles, Laura Goodly, Aline Heisser-Ovid, Alice Avery, Shirley Rachal, Theresa Roche, Carolyn Perkins, Gloria Wiley, Shirley Pierre, Gertie Moncrief, Franz Aubry, Helen Cissell, and Micaela Le Blanc-Faithful Navigator Chapter 13. 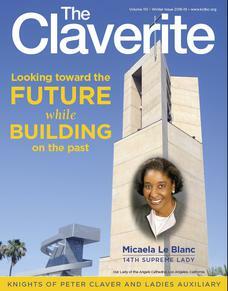 Marie Archer-Jones, Michelle Wilson, Charlotte Canfield, Zackrea Jones, Aline Heisser-Ovid, and Margaret Chapman. 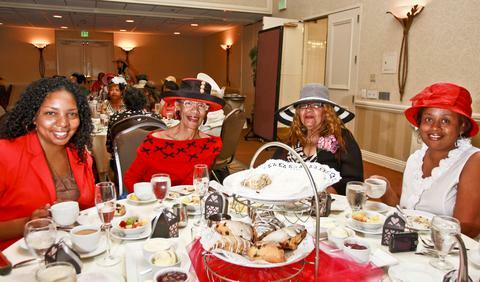 Attending the first annual "Women with Children in Crisis" fundraiser to benefit the Good Shepherd Shelter for Battered Women with Children are seated left to right, Stacy Pyles daughter of Gracious Lady Cheryl Pyles of Chapter 13, Lady Andrea Hardin of St. Josephine Bakhita Court 369 -Phoenix, AZ; Gracious Lady Marie Archer Jones member of Chapter 13, and Vice Grand Lady Cassandra Young of St. Josephine Court #369-Phoeniz, AZ. Chapter 13 delivers Easter Baskets to the Good Shepherd Women and Children's shelter on April 12, 2009.